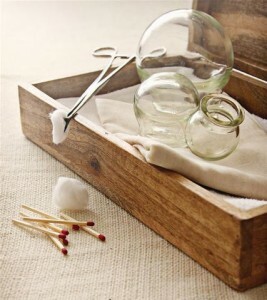 Cupping - now almost forgotten, but in its simplicity and effectiveness quite an ingenious way to get rid of most of the diseases to simple conclusions dirty blood from the body. This acupuncture method of removing and cleaning the energy channels of the body. Hidzhama.Krov - one of the most important elements of the human body. It is involved in many processes such as transpor t of oxygen into cells, transport of various hormones and nutrients, metabolic products. Blood is involved in thermoregulation, it also regulates the water-salt balance. And that's not all of its functions. Not everyone knows, however, that the blood stagnates in humans; the veins and arteries flowing only part of the body's blood. The rest of it is in reserves and waiting for emergency situations, such as bleeding, hard work, hypoxia, and others. Without blood flow begins to "grow old" loses its quality, absorbs all the bad that enters the body due to malnutrition, dirty air and water stress, etc. Cupping - it is just something that helps get rid of stagnant dirty blood. That bloodletting useful to the human body and certainly not questioned. Due to its high efficiency cupping training today is very popular among medical practitioners, as it allows to carry out prevention and treatment of prostatitis, hemorrhoids, diabetes, rheumatism, hepatitis, as well as pain in the neck, back, head, shoulders, muscles and many other diseases. In connection with such a broad scope cupping the book are of particular interest even among ordinary citizens, not related to medicine. Many of them are for the better understanding of the principles of this technique as cupping watching videos on specialized web resources. And this is not a complete list of problems that can solve cupping treatment. Its main feature is the absence of the need to introduce into the human body of any chemicals or carrying out surgery - this technique uses only internal reserves of the person. In many countries, it is recognized as the ideal way to restore the body with the help of his own capabilities. History knows a great many cases of successful application of bloodletting that many scientists have used it for the prevention and treatment of various diseases. Among them was even Hippocrates.